An off-duty Darien police officer alerted police to two suspicious teenagers on West Avenue who, it turned out, were riding stolen bicycles and had on them tools for committing a burglary, a BB gun and marijuana, police said. 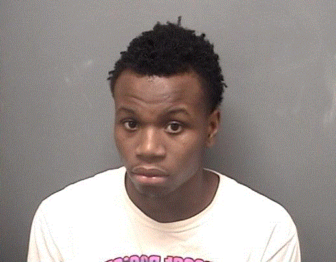 Arrest photo of Doudly Pierre, 19, of Noble Street, Stamford. At 11:41 p.m. on Saturday, Sept. 16, the off-duty officer saw the two walking on West Avenue near Ridgeley Street. Thinking the two looked suspicious, the officer called the Police Department. The two were described as two males walking with bicycles and wearing dark clothing, including hooded sweatshirts. Officers were dispatched to the scene and found the two — Doudly Pierre, 19, of Noble Street in Stamford, and a 17-year-old Stamford boy. The officer reached into the sweatshirt pocket and pulled out what appeared to be a BB gun, and Pierre again said that it wasn’t real. The officer saw that it resembled an actual firearm and didn’t have the obvious marking on it to indicate that it’s a BB gun — a red tip on the barrel. Pierre also had several pairs of latex gloves on him, along with an unwound piece of metal wire, something commonly used to pick locks. When police spoke with the 17-year-old “it was determined” that the bikes the two had with them had been stolen in Greenwich. The boy also had a small bag with less than half an ounce of marijuana in it. The two were arrested. At Police Headquarters, Pierre admitted that he and the boy planned to go to a friend’s house in Norwalk and burglarize it. He said the plan was to have the teenager enter the home and distract the friend while Pierre burglarized it. The latex gloves would have prevented Pierre from leaving fingerprints during the burglary. Asked about the BB gun, Pierre said it was for his protection. He confirmed that the bicycle found with him was stolen in Greenwich. The teenage boy was charged with conspiracy to commit first-degree burglary, sixth-degree larceny and possession of less than half an ounce of marijuana. He was issued a juvenile summons to appear in Juvenile Court in Stamford and released to a parent. Pierre was charged with interfering with an officer (the police announcement did not say why), possession of burglar’s tools, carrying a dangerous weapon (a charge which includes carrying a BB gun, except in certain very restricted circumstances), sixth-degree larceny and conspiracy to commit first-degree burglary. He was held on $5,000 until he appeared later in state Superior Court in Stamford, where his bond was lowered to $1,000. He still hadn’t paid it, according to the state Judicial Branch Website on Wednesday morning, Sept. 26. He is due in court again on Oct. 12. When police stopped a gray Honda Accord on West Avenue at about 12:30 Wednesday morning, Nov. 21, they determined the driver was intoxicated with alcohol, and his passenger, also intoxicated, had marijuana and traces of cocaine in his backpack, police said.